Very often, mushroom growers, especially beginners, plan on having a mycelium production along with mushroom production in the same enterprise. It's practically always a dead-end. High-quality mushroom mycelium production is a production that is difficult enough to be moved to a separate enterprise. Mushroom growers have only two choices: buying mycelium form specialized enterprises (or from their dealers), or buying ready compost that has been spawned in these enterprises. By the way, there aren't many enterprises of that kind. Mycelium from these enterprises is of a very good quality, and from it we were able to cultivate 300 and more kilograms of mushrooms on a ton of compost. A yield of 200-250 kilograms of mushrooms per ton of compost using this mycelium is guaranteed. Considering the cost, which is two times lower than the cost of imported mycelium, it can be said that the mycelium of these enterprises is able to meet competition with mycelium from overseas.Very often, mushroom growers, especially beginners, plan on having a mycelium production along with mushroom production in the same enterprise. It's practically always a dead-end. High-quality mushroom mycelium production is a production that is difficult enough to be moved to a separate enterprise. Mushroom growers have only two choices: buying mycelium form specialized enterprises (or from their dealers), or buying ready compost that has been spawned in these enterprises. By the way, there aren't many enterprises of that kind. Mycelium from these enterprises is of a very good quality, and from it we were able to cultivate 300 and more kilograms of mushrooms on a ton of compost. 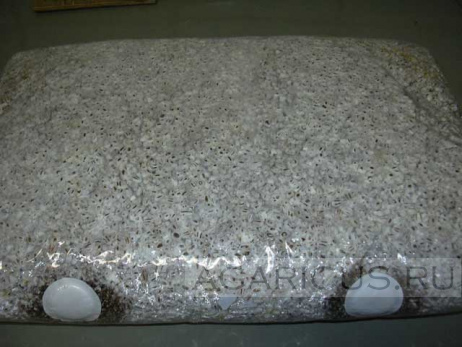 A yield of 200-250 kilograms of mushrooms per ton of compost using this mycelium is guaranteed. Considering the cost, which is two times lower than the cost of imported mycelium, it can be said that the mycelium of these enterprises is able to meet competition with mycelium from overseas. Mycelium production overseas is mainly concentrated in four enterprises. That's «Amycel», «Le-Lion», «Italspawn» and «Sylvan». Unfortunately, in Russia there are only representatives of the «Sylvan» firm. Undoubtedly, the imported mycelium's potential is higher than that of our mycelium. But, in Russia there are practically no industries that are able to create all conditions for a 100% use of the imported mycelium potential. 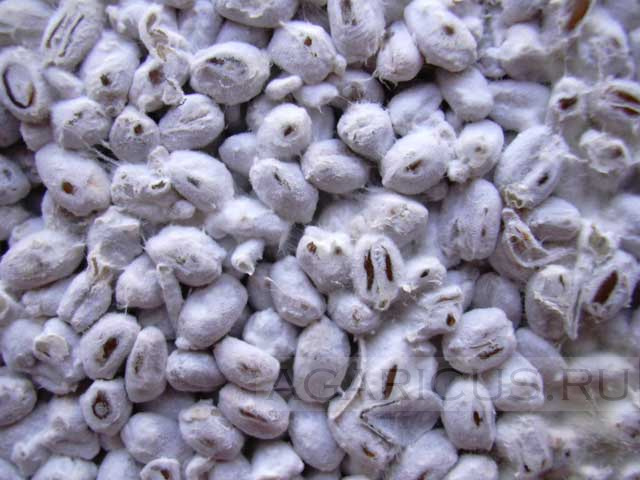 And in order to get a yield of 15-20 kilograms per square meter, a cheaper native mycelium is suited. But of course the final decision in choosing mycelium belongs to the mushroom grower. We just want to emphasize that the use of imported mycelium of the highest quality and price, doesn't guarantee a high yield. Furthermore, in order to open its greatest abilities, it will require a more serious attitude toward the process of mushroom cultivation and compost preparation. Closed transport is used for mycelium transportation – this transport has to be cleaned and disinfected beforehand. At transportation over long distances, it's best to use machines with cooling equipment, so that the mycelium doesn't warm up while it's transported. The boxes of mycelium should be put on trays, leaving a little gap between them for ventilation. Mycelium is stored in a cold store equipped with automation to maintain the specified temperature of 0 -2 degrees Celsius (up to 5 degrees). The mycelium storage time is usually 3 months. But there were times when mycelium that was stored for about a year was spawned and that gave a pretty good yield. There were situations when mycelium that has been frozen to -13 degrees was spawned. There were mushrooms too, but doing this in an industrial mushroom production isn't advisable.